At the end of September 1941, more than a million German soldiers lined up along the frontline just 180 miles west of Moscow. They were well trained, confident, and had good reasons to hope that the war in the East would be over with one last offensive. At the end of September 1941, more than a million German soldiers lined up along the frontline just 180 miles west of Moscow. They were well trained, confident, and had good reasons to hope that the war in the East would be over with one last offensive. Facing them was an equally large Soviet force, but whose soldiers were neither as well trained nor as confident. When the Germans struck, disaster soon befell the Soviet defenders. German panzer spearheads cut through enemy defences and thrust deeply to encircle most of the Soviet soldiers on the approaches to Moscow. Within a few weeks, most of them marched into captivity, where a grim fate awaited them. Despite the overwhelming initial German success, however, the Soviet capital did not fall. German combat units as well as supply transport were bogged down in mud caused by autumn rains. General Zhukov was called back to Moscow and given the desperate task to recreate defence lines west of Moscow. The mud allowed him time to accomplish this, and when the Germans again began to attack in November, they met stiffer resistance. Even so, they came perilously close to the capital, and if the vicissitudes of weather had cooperated, would have seized it. Though German units were also fighting desperately by now, the Soviet build-up soon exceeded their own. 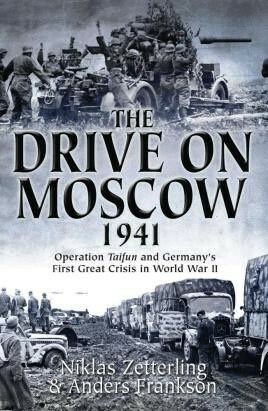 The Drive on Moscow, 1941 is based on numerous archival records, personal diaries, letters and other sources. It recreates the battle from the perspective of the soldiers as well as the generals. The battle, not fought in isolation, had a crucial role in the overall German strategy in the East, and its outcome reveals why the failure of the German assault on Moscow may well have been the true turning point of World War II. Well-written and complete with 24 photographs and 7 maps this is an excellent publication from authors Niklas Zetterling and Anders Frankson. The strength of this work is its focus on that human dimension; attention is given to field marshals and national leaders, but equal space is given to soldiers on the front, facing artillery and mines along with horrible weather. This book places the reader alongside combatants at all levels.